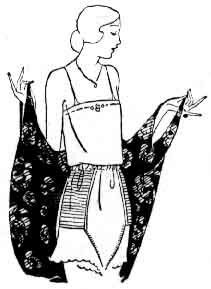 The right mannequin wears an early 1990s Kotex napkin belt, essentially the same as one from the 1920s. Clasps hold the pad to it, although pins could be used. About half of the women who responded to the survey used elastic belts (closest mannequin in the photo) to hold their pads in place and usually could not remember what brand it was. They overwhelmingly used safety pins to attach pads to the belt - remember the Tampax ads crowing "no pins"? - because the clasps that came with many belts could fail. And they avoided belts that came apart to be buttoned on, because they too often failed. That meant that women usually put the belt on over their heads and wore them either at waist or low on the hips. Some women made their own from gauze, elastic or ribbon. Few women, 162, liked "sanitary aprons" because they had a rubber odor, faded or turned yellow or gray with washing, tore easily and slipped and twisted. which might be a typo (it is not an item in the statistics table). They trap moisture, which is not healthy. A high school faculty member said, "The ideal thing would be to get protection enough in the napkin." Gilbreth preferred rubber step-ins (at left and here - 67 wrote that they used them) to aprons and bloomers because they didn't become hot or slip, "but it is a nuisance to have to wear so much rubber when only a little is needed. . . . [A] small rubber insert in the back . . . would give ample protection." Many women, 370, powdered their pads, but just a few used Mum cream (yes, Mum) or Amolin powder deodorant.